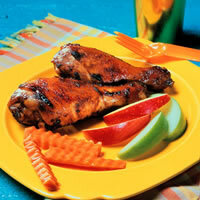 Apple butter and molasses bring a taste of the country to these sweetly glazed drumsticks. In medium bowl, stir together all ingredients for the marinade. Add the drumsticks and toss to coat. Cover and refrigerate for 15 minutes. Preheat the broiler. Line a broiler pan with aluminum foil and then set the drumsticks in it. Broil for 13-15 minutes, turning the drumsticks occasionally and brushing them with marinade. Serve with apple slices.